The Canon Angle Finder C serves two primary purposes. The first and most commonly served purpose is to create a more comfortable viewing angle when shooting with the camera low or at an awkward angle (such as when shooting upward). The second is to help the photographer to obtain precise manual focus through its 2.5x magnification feature. Supplied with Finder Adapters Ec-C and Ed-C, the Canon Angle Finder C will fit any EOS camera (and many other brand film and digital SLRs) by replacing the standard eyecup. Squeeze the eyecup to release the catch and slide it up - slide the AF-C back into the eyecup's position and it is ready to go. Once in place, look into the eyepiece and adjust the Angle Finder C's diopter correction until the camera's focus screen is sharp. A liberal amount of diopter correction is available - Most of the eyepiece side of the angle rotates and extends up to .4" (10mm) during correction. At this point, if set to the 1.25x setting, the Angle Finder C will show a compete view of the camera's viewfinder including the shot settings information even on a full frame body. At the 2.5x setting, the Angle Finder C magnifies the viewfinder image - but crops the left and right sides from a 1.6x FOVCF viewfinder and all 4 sides from a full frame viewfinder - leaving only a round image. The advantage of the higher magnification setting is that critical manual focusing is much easier. The Canon Angle Finder C's eyepiece rotates 360 degrees around the camera viewfinder with positive detents at 45 degree increments - but it is limited a 90 degree orientation to the camera viewfinder. This 90 degree viewfinder angle makes shooting from difficult angles easy. Shooting with the camera on the ground gives a unique perspective to your subjects. Macro photographers are common users of this technique. Sports photographers will at times capture their action from ground. Telescope-connected cameras will frequently have an AF-C attached to them. If you are shooting upward, this device will make your life much easier. Anyone who is tired of squatting down to look through a low-tripod-mounted camera will appreciate an Angle Finder C.
Even eyeglass wearers will find the Angle Finder C comfortable to use. Eye relief is good and the rubber eyecup can be rolled down. Everyone will appreciate the good optical quality. The AF-C provides a normally-oriented image to the viewer (lesser angle finders deliver an upside-down image). 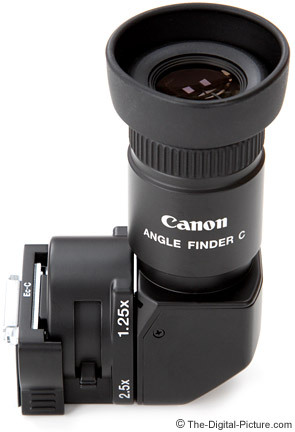 The Canon Angle Finder C is solidly built and features metal connections. It weighs 4.4 oz (124.7g) and measures 3.5" x 2.5" x 1.5" (89mm x 63.5mm x 38.1mm) - small and light. A nice padded pouch is included. This device is not for everyone, but many of us can find more than one great use for the Angle Finder C.